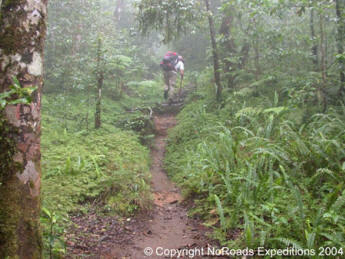 Timbanuh trek is the combination of tropical rain forests and savannas. This trek is a new path opened by TNGR. Compared to three other trek, facilities and infrastructure is still inadequate. However the advantages of this route is the availability of enough water along the climbing. 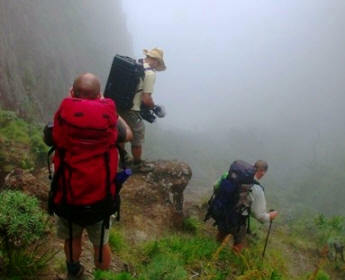 Timbanuh Trekking currently only limited to South Pelawangan and South Peak Rinjani. Trip to the lake is not recommended because the condition of the path is very steep and dangerous. Through the southern route is a fusion of the two trails above or a combination of tropical rain forests and savannas, with the distance from Jati Village to Pelawangan Timbanuh about 8-10 hours. Is a new path opened by TNGR, compared to two other trails, facilities and infrastructure is still inadequate. 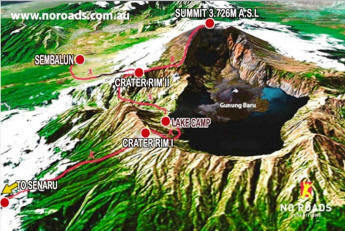 However the advantages of this route is the availability of enough epidermis along the climbing, hiking Timbanuh currently only limited to Southern Rim and South Peak Rinjani, where as trip to the lake is not recommended because the condition of the path is very steep and not arranged, so the level of danger is very high. From Southern Rim, you can see the crater of Mount and Summit Gunung baru clearly, as compared with two other Rims and Southern Rim is the closest way to the New Mount Finger. At this point you can through several fields edelweiss, and you can go to the top of Rinjani south, from the top of this you can only see the top of Rinjani,the distance is not so far away but you can not go there because it was covered by 230 m2 and estimated the water content of 1375 million m3, the disposal of excess water contained in the northeast shore of the lake that is kokoq Puteq (river) you will find a pool of hot water immersion is called Aik Kalak (hot spring). Early morning we leave fro hotel for Timbanuh village, it takes around 2,5 hrs driving. Then start for the beginning of a challenging 6 or 7 hour day. We head for Timbanuh on Rinjani’s southern slope. Over night at base cap 3. After breakfast, Enjoying the sun rise view From southern part of the mount. Then we will climb to the south rim. Awesome views over the lake, Bali and Rinjani’s summit. it will take around 4 or 5 hours, spend night on the rim seeing different view of the lake, summit. After breakfast, enjoying morning view Southern rim crater. heading down to Timbanuh. and drop you back to the hotel.